Parents, researchers and charities join forces to create new resource for parents of children with learning disabilities. 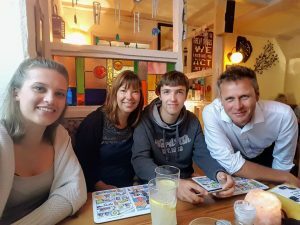 The University of Warwick, Mencap, Cerebra, and the Challenging Behaviour Foundation have teamed up with parents of children with learning disabilities to produce a new Parent’s Guide on improving the well-being of young children with learning disabilities. The guide is being launched today (25th May) in Belfast and you can download the the booklet here. Research has shown that young people with learning disabilities face more barriers to achieving well-being than children without a learning disability, but also that there are practical steps and strategies which parents can take to change this. Combining the practical wisdom of parents with insight from the University of Warwick’s twenty years of research into the wellbeing of families of children with a learning disability, the new guide presents hints and tips, backed up by research, for parents to use in their family lives to promote the well-being of their children and to develop positive family relationships. The Parent’s Guide has been created to help parents support the well-being of children from 0 – 5. It offers suggestions on ways to build and support warm, positive family relationships, and also includes a chapter on activities parents and siblings can do to support the development of a child with learning disabilities. Each chapter includes advice from parents, suggested activities, and space for personal notes and reflection. The guide has been written by Dr Samantha Flynn, Dr Vaso Totsika and Professor Richard Hastings of the University of Warwick’s Centre for Educational Development, Appraisal and Research (CEDAR), in collaboration with family carers of children with learning disabilities, Margaret Kelly and Joanne Sweeney of Mencap Northern Ireland, Tracy Elliott from Cerebra and Viv Cooper OBE and Jacqui Shurlock from The Challenging Behaviour Foundation. “We wanted to share what CEDAR has found out about the best ways parents can support the well-being of children with learning disabilities in a format that was easy to understand and also easy for parents to put into practice. “We are delighted to have worked alongside the University of Warwick, parents and various organisations to produce this wonderful guide to help support parents of young children with a learning disability. “There are currently 5,000 children with a learning disability under the age of seven in Northern Ireland and we believe every young child with a learning disability should have access to early intervention services that support their development from birth. “Cerebra is the charity that works with families who include children with brain conditions. By listening to families we know that one of their key concerns is for their child’s well-being, but they often question what well-being means for their child and how can they promote it. “The Challenging Behaviour Foundation supports families of children and adults with severe learning disabilities whose behaviours are described as challenging. Development of this booklet was supported by an award from the ESRC Impact Acceleration Award of the University of Warwick (ES/M500434/1). The research that primarily fed into this booklet has been funded by a grant from the Baily Thomas Charitable Fund (TRUST/VC/AC/SG/4016-6851). Some of the previous research that was included in the booklet had been supported by the Economic and Social Research Council. Mencap, Cerebra, and the Challenging Behaviour Foundation have provided support for a number of the studies included in this booklet, both financial and collaborative. The 2018 UWTSD Swansea Triathlon has come and gone for another year, but for Team Imogen this has been an incredible start to our adventures in 2018! Six-year-old Imogen Ashwell-Lewis, who has cerebral palsy, captained the charity team with a difference. She was supported around the course by a team consisting of the three designers from our Innovation Centre which is based in Swansea. The day got off to an incredible start with our resident swimmer, Dan Cuthbertson taking the lead on the swim. This led on to the bike ride where Gerallt Devonald towed Imogen in style. Lastly Dr Ross Head smashed the last leg of the course and ran with Imogen to the finish. The race ended with the whole team joining Ross and Imogen to cross the finish line – full of smiles! We would like to thank the filming crew from RS Components who followed our story, the incredible friends and family who supported us throughout the course, the organisers who put on such an incredible event and of course, Cerebra’s little super star Imogen who was amazing all day. This is the start of our Triathlon Journey 2018 – Up next, the Superhero Series 2018! You can show your support for team Imogen and their efforts through their Just Giving page. If you would like to find out more about the Superhero Series, get in touch with the team at [email protected]. We’re also looking for families to join us as part of the Superhero Series so please get in touch! Pupils from Builth Wells High School designed the crown and took their inspiration from their local area – its history and its legends. Once the pupils had agreed the final design, it was then sent to Dan who had eight weeks to create the finished crown. The request to create the crown came via Dan’s sister, Sarah Cuthbertson who teaches Technology at the school. Dan was delighted to have the opportunity to create the piece and was pleased to be working with the talented pupils. 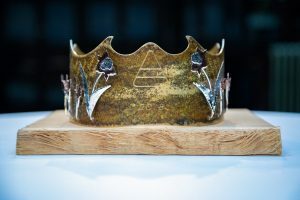 Using a host of natural materials – brass, copper, silver and oak – Dan brought the design to life and created the stunning crown that will be awarded to the winner of one of the Eisteddfod’s main literary competitions during the week-long youth festival. Dan has worked for the Cerebra Innovation Centre within the University of Wales Trinity Saint David for over six years now. As UWTSD Product Design graduate, Dan loves to use his skills to create equipment for children with brain conditions. “I am very grateful to Cerebra for giving me the opportunity to be released from my daily work to create this year’s Urdd Eisteddfod crown. I would also like to thank the University for its support and for having the opportunity to use the great equipment we have at the workshops within the University’s Alex building in Swansea. “It has been a huge pleasure to work with a group of enthusiastic pupils and to have had the opportunity to bring their beautiful design to life,” he adds. The Brecon and Radnorshire Urdd Eisteddfod will be held on the Royal Welsh Showground in Builth Wells, 28 May – 2 June. The crowning ceremony takes place on Friday, 1 June. “My daughter, Mair, is autistic with severe and enduring mental health difficulties. She was diagnosed with autism 6 years ago when she was 15. She was referred by her school and diagnosed through CAMHS (Child and Adolescent Mental Health Services) because she had developed serious mental health problems. My family have been on a roller-coaster ride of suicide attempts, A&E Admissions, Psychiatric inpatient admissions, discharge and recovery, relapse and re-admission, securing support, losing support, progress followed by decline followed by progress, understanding and lack of understanding from others, hope and fear and hope again. The most difficult thing has been dealing with shattered hope; I would be better off if I did not hope, but that would be to give up and I will never do that. I live in dread of withheld numbers calling my phone (the NHS and Police call like this) in trepidation of what I am about to be told. I could write a dissertation on the failings of mental health services. During Mair’s last inpatient admission, she absconded from the ward on several occasions despite being on a cycle of 15-minute checks, once it took 45 minutes to notice she was gone. Twice, while she had absconded she took an overdose of paracetamol and ended up in A&E. This is while we, her family, thought she was safe. The main reason behind her admission being to keep her safe. On discharge from hospital, the psychiatrist acknowledged that Mair would probably go into crisis again. This is terrifying for us as each crisis results in more serious self-harm and more suicide ideation. Our story has been characterised by delay and poor communication between services and even within services. In our experience, the professionals caring for Mair have not spoken to each other, staff turnover and lack of inter agency working has meant we have had to repeat our story many times, wasting valuable appointment time as well as being extremely frustrating and confusing. I have needed to be an advocate for my daughter, and as she has become an adult, she has had to become her own advocate as services are hard to access and we have had to push. The crux of the problem is that, despite political rhetoric, mental health services are not on an equal footing with physical health services. My daughter has life threatening mental illness; if she had life threatening physical illness, our experiences would be different. There would be fewer delays in getting treatment for one thing and more support for families. Autism is different in girls. Girls are excellent at masking symptoms of autism, my daughter did this thereby her diagnosis was delayed. She knew she was different but did not know why; she developed elaborate masking behaviours that worked well at first, so well no one, including her family, noticed. This eventually became too much and she became mentally unwell. Those learned behaviours are now difficult to undo, not knowing what was wrong meant there was no understanding for Mair of why she was different, she came to her own conclusions and felt she simply did not belong. Early autism diagnosis is vital, even without support services to refer families to, as it aids understanding, awareness and acceptance of difference. I have witnessed medical professionals claiming that autism diagnosis is not a priority as there is nowhere to refer families post diagnosis. While this lack of services for autism is of great concern, it is misguided to not diagnose as it fails to recognise the importance of understanding, awareness and acceptance. For my family I believe earlier diagnosis of autism could have minimised, maybe even prevented, the development of severe and enduring mental health problems. Like most mothers when things first went awry I forensically examined our family life looking for what I did wrong. I switched between concentrating on past mistakes to worrying about future scenarios. This was unhelpful. I have come to accept that I made mistakes, but all parents get somethings wrong. I do not have a time machine to go back and change things so now I try to balance it with what I got right. In particular my children have always been loved, well cared for and the centre of our family. They always have and always will come first. Likewise, I try not to worry about the future, in particular to dwell on scenarios that might never come to be, this is exhausting and not constructive. Mindfulness principles have been helpful and I continue to try and practice them whenever things feel like they are spiralling out of control. The hardest lesson for me as a mother has been to understand that I cannot ‘fix’ this. I need to work with service providers who have the expertise and experience to help, I’ve had to relinquish control. My role, I’ve come to accept, is to provide love, support and security every day and to work with the professionals. This is not easy, but I continue to preserver with varied success. It’s important, I believe, that the professionals listen to me and my husband and our concerns. We know Mair better than them. We have 24/7 care responsibility, they should be working with us. Nearly all NICE guidance talks about the importance of working with families but the reality in our experience has been quite different. We have needed support on our journey and got it from local support groups and charities. I feel less isolated by talking with families who have similar experiences and a local mental health charity, Hafal, has been able to advise and support us during our bleakest hours. This external support has been vital to our well-being. Not everything has been a negative experience. Individuals have more often than not been caring and dedicated but over stretched by working in underfunded services. Mair’s school, and more recently her college, have been supportive. I would single out Mair’s interaction with the police which has been outstanding, they have been truly lifesaving and acted with genuine kindness and understanding. As a family, we have become much closer. I know the people I can rely on for support and they are always there. My son is an extraordinarily thoughtful and considerate young man and Mair is an accomplished young woman, despite her struggles. She has achieved so much more in her 21 years than many people ever will. She addresses large conferences, participates in consultations, appears in TV and Radio interviews all to promote mental health awareness and tackle stigma. She has won awards for her work, most recently the St David Award for Citizenship. We are a strong family unit that has stuck together and we will be OK, all of us. We are working on a joint funding bid with the Institute of Psychological Medicine and Clinical Neurosciences, Cardiff University for a ground-breaking project on children’s mental health. The Institute of Psychological Medicine and Clinical Neurosciences (IPMCN) conduct high quality research into neurodevelopmental disorders and mental health problems in children and young people. Their research aims to learn more about the early origins, development and impacts of neurodevelopmental and mental health problems on children, young people and their families. Their overall aim is to improve prevention, interventions and policy. This Project focuses on developmental genetic conditions called ‘Copy Number Variants’ (CNVs). Some people are born with genetic changes called ‘Copy Number Variants’ (CNVs). In some cases a section of their genetic code might be repeated (a duplication), and in other cases a section might be missing (a deletion). Some CNVs appear to have little or no effect, but some can be very serious. Occasionally a CNV might even give someone better resistance to certain illnesses.Generally however, CNVs are a significant cause of learning and developmental disorders, some of which are linked to a higher chance of experiencing serious psychiatric disorders. Our project aims to develop more effective ways of ensuring children with intellectual and developmental disorders (IDD’s) have greater access to modern personalized genomic and integrated psychiatry services according to parents’ needs and preferences. Research at Cardiff University means we know which CNV’s carry risk of debilitating psychiatric illness; understand environmental influences and are able to recognize indicative emerging behaviors and emotional difficulties. This knowledge, when shared, will facilitate earlier intervention that is more appropriate. Intervention that will improve longer-term outcomes for children and their families. We will use this knowledge to empower anxious families to access the best care for their children and engage with and influence multi-disciplinary services for children with intellectual and developmental disabilities. This project will support the creation and implementation of new, highly innovative and locally tailored, Shared Decision and Referral Support Services (SDRSS) that link inter-agency communications and decision-making. These services will engage with and influence service providers as well as advising, and directly advocating for families in need of services. As part of this project, we would want to develop strong partnerships with small condition specific support groups developing cooperative approach to sharing and developing information resources. Use Cerebra’s skills, capabilities and family contacts to develop high quality accessible multimedia resources for families. Work collaboratively with service providers to develop and test a model way of working to achieve improved health and education outcomes for children. We will know shortly if our bid has been successful, so watch out for the press releases. We’re delighted to announce that BorrowBox is coming soon to our library. With BorrowBox you’ll be able to borrow e-books and e-audiobooks from Cerebra 24 hours a day, 7 days a week. .
Recognised as the No1 library download platform in the world, BorrowBox is the brainchild of Bolinda Digital. Unique because it will enable members of our library to download and borrow eBooks and e-Audiobooks via digital loans. BorrowBox is the only app of its kind in the world with an inbuilt eBook reader and eAudiobook player. On your phone, on your iPad, on your home computer, BorrowBox means that the doors to our library will never close – you can access books around the clock. BorrowBox can be used online and with Apple iOS and Google Android devices. You’ll be able to download ebooks directly from the the Cerebra library or from the BorrowBox app. Keep an eye open for more information about how you will be able to use this wonderful resource, completely free of charge.